The San Diego District Attorney’s Office is expected to file charges against deputies involved in a violent arrest in Vista, according to people familiar with case. According to the DA’s Office, Deputy Nicholas Morgan is charged with two misdemeanor counts of assault without lawful necessity by an officer. The 27-year-old faces up to two years in jail if convicted. The DA’s Office said 31-year-old Deputy Joshua Nahan is charged with one misdemeanor count of assault without lawful necessity by an officer. He faces up to one year in jail if convicted. Morgan and Nahan are scheduled to be arraigned Nov. 30 in Vista. 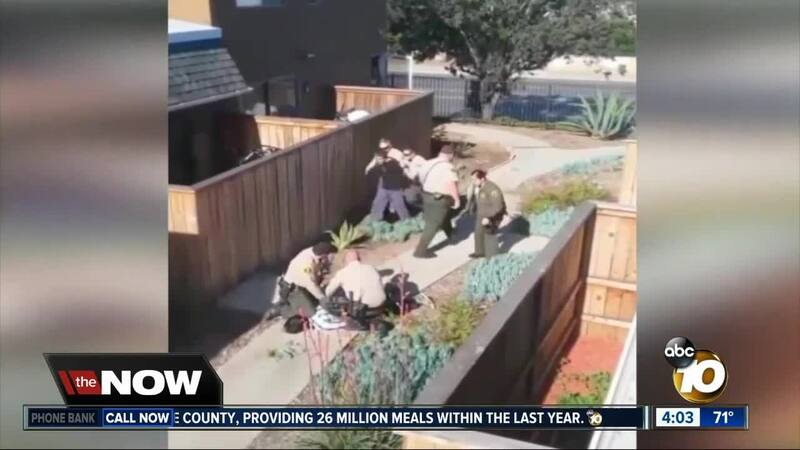 VISTA, Calif. (KGTV) - The San Diego District Attorney’s Office is expected to file charges against deputies involved in a violent arrest in Vista, according to people familiar with case. Doug Applegate, the lawyer for Gerardo Martinez and Gerardo Martinez Jr. said the DA’s office contacted him Monday about the charges. They stem from the deputies’ actions during an arrest on May 7th when they were called to an apartment on Madera Lane in Vista for a report of domestic violence. In the video, deputies push Martinez into a fence while handcuffed. Meanwhile, his son, Martinez Jr. is seen being repeatedly hit in the head by a deputy while held on a concrete sidewalk. Yusef Miller, a civil rights activist with the group Council on American Islamic Relations, said he also heard from a source that the DA’s Office will be filing charges. It’s unclear at this point how many deputies will be charged and with what crimes. Martinez Jr. ended up taking a plea deal in the domestic violence case, receiving six months of probation. Charges against his father were eventually dropped. "On May 7th, 2018, the San Diego County Sheriff's Department received a 9-1-1 call from a woman who was the victim of domestic violence and being held against her will at 1120 Madera Lane, Vista. Deputies responded to the call. As a result of that call, two men were ultimately arrested. The actions taken by the deputies during the arrest were captured on video. We were made aware of the video the day after the arrest. Upon reviewing the video, we immediately opened an internal investigation and the deputies involved were placed on administrative assignment. The investigation was comprehensive and included reviewing body worn camera video, all relevant reports and interviews with involved parties. Once complete, the case was referred to the District Attorney's Office for review. The Department does not tolerate misconduct of any kind. We have the utmost confidence in the criminal justice system and we will continue to coordinate with and support the District Attorney's Office as these cases move through the judicial process." A spokesperson for the DA’s office said they would comment Tuesday morning.